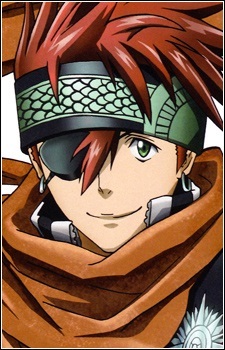 Lavi "Bookman Junior, Baka Usagi"
- Konbo Ban: Gouraiten (コンボ判 剛雷天, lit. Combo Seal: Strong Thunder of the Heavens): using both fire and heaven seals to create a huge snake of fire and iron. Also making a shield-like flame wall. It was shown when Bookman told Lavi to use the wood seal to clear the clouds (Three Akuma were hiding behind the clouds). Lavi stated that he forgot he could use it to affect nature directly, and as he remembered it the question mark turned into a kanji that he used right away. If seen more carefully the kanji for the wood seal can be seen throughout the manga whenever Lavi summons his seals long before the use of the actual seal itself (e.g. during the use of the heaven seal). At the moment just before its first use the seal can be seen just behind Lavi's head and had never transformed from a question mark in the first place. The marks of water and earth also appear among his seals. He likes to call Bookman "Panda" due to the thick black circles around his eyes; a converted Akuma "Chomesuke"; and Arystar Krory"Kuro-chan" in the anime and "Kro-chan" in the manga. He is the only character other than General Tiedoll to call Kanda by his given name (that name being Yuu, also translated as Yū or Yuu), and apparently speaks to him outside of missions, a fact that was shown when he called Allen "beansprout" (moyashi), saying that if Kanda could call him that, Lavi could as well, as he is the same age as Kanda. He has a habit of teasing Allen, and deems himself as his big brother. A recurring gag in the series is Lavi's fondness for beautiful older women, whenever he sees a woman his type (Example: Eliade) he'll yell out "Strike!" with hearts in his eye. In recent chapters (beginning with 114), Lavi was fighting an incarnation of his past created by Road in one of her dimensions. It was revealed that his name, Lavi, is just an alias (his 49th, to be exact). He had cast aside his old name and background to show his commitment to being a Bookman. It was also revealed that Lavi was once cold and indifferent to others, for a Bookman only lives to view and record history and that humans are nothing more than 'ink' on a page. However, over time Lavi's personality changed and he began to truly care about others, slowly casting aside his identity as a Bookman. When he thought that Allen was killed by Tyki Mikk, he tried to avenge Allen by attempting to kill Tyki himself. During his fight against his past incarnation, his 'heart' (current personality) was supposedly destroyed. This caused his past incarnation, under the control of Road, to emerge in his physical body and savagely attack Allen. Unwilling to hurt Lavi, Allen attacked Road but failed to harm her, as her current body was not her true form. Lavi's current self managed to resurface and suppress his past self. He then engulfed himself in a massive Hi-Ban to attack Road in the real world, while simultaneously stabbing her through the heart within her dimension, defeating her. In recent chapters, after the appearance of Cross Marian to their aid, Lavi's status was unknown after falling into a 'hole' made by the Millennium Earl's flashy entrance. He attempted to lengthen his Innocence to save himself, but it shattered when Allen grabbed Lavi's Innocence in an effort to pull him up. Although he was apparently lost in the 'hole' in the Ark, he was shown to have been revived along with the rest of the 'lost' Exorcists on the Ark when the Ark was restored by Allen. He is now back at Black Order HQ waiting for his Innocence to be fixed. When Lulubell and her Akuma attack the HQ, he is unable to assist Allen as he cannot activate his (shattered) hammer. When the level four akuma attacked Komui and the others, he and Kanda both act as a distraction in order for Lenalee to quickly create her newly formed innocence. There are many different translations of his name, such as Ravi, Rabi, Labi. But it is found in the D.gray-man Omake from episode 61 that the correct spelling is Lavi. Have you seen every single D.Gray-man opening? With heavy bents towards J-Rock, the four tunes all pack a punch fit to set the stage for the action-packed episodes that follow. Come check them out!